We know that it’s easy to lose sleep worrying about your moving and storage needs. We’ve met many people who say that one of the most time-consuming parts of a move is finding a place to store items that they can’t take with them right away. 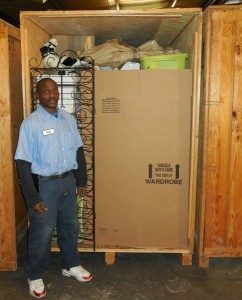 My Guys Moving & Storage of Virginia Beach offers convenient storage solutions to anyone looking to keep items safe, for almost any amount of time. Our warehouse is perfect for any Virginia Beach storage need. 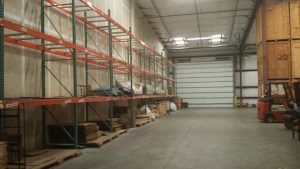 If you would like a temporary space because of a home renovation, a long-term option for a job assignment, or anything in between, our warehouse is safe, secure and climate controlled. We operate a large, dry, safe and secure storage warehouse, full of large wooden storage containers called “vaults”. The vaults typically hold enough furniture and boxes to fill an average size residential room. Larger items, like overstuffed couches, can still be stored by carefully and thoroughly shrink wrapping them to prevent damage. Our storage experts can accommodate all types of needs and we keep everything meticulously organized; ready for whenever you want to pick them up. The charge per vault covers the loading of your belongings from your location into our truck, transporting your items back to our warehouse and packing and loading them into the vaults. There is also a charge per month to maintain your vaults in our warehouse. When you are ready to move out of our storage, if you are moving locally, the charge to move out would be the same as the charge to move in. We require a security deposit to secure the date and time of your move and we accept checks, cash, and any major credit or debit card, including Visa, MasterCard, American Express, and Discover. There is also an automatic billing option available by using the credit/debit card of your choice. My Guys Moving & Storage of Virginia Beach offers convenient storage solutions to anyone looking to keep items safe, for almost any amount of time. We charge for storage on a monthly per vault basis, plus the usual trip and fuel surcharges. This covers all aspects of the storage process from transporting your belongings, to packing them in vaults, to maintaining the facility. If you have any questions about our Virginia Beach storage options, or if you would like to receive a free quote, give us a call today or fill out our online form. Vaulted warehouse storage and crating in a climate-controlled and monitored facility. With My Guys, there’s no need to worry about the safety of your belongings, the amount of room in your home or who’s handling your items. With our team of courteous professionals, you can always know that your move is receiving the care and attention needed to make sure you stay stress-free. To get started with a free warehouse storage quote, just fill out our online form.